The club was founded on the 8th April 1948 and the following are excerpts of notes taken from that first meeting. 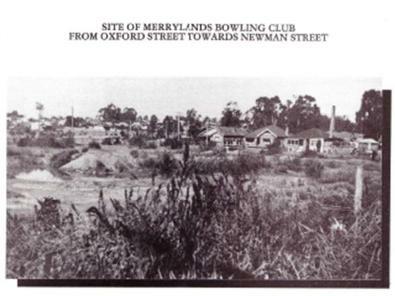 Aldermen William Campbell & William Simpson met one day in March, 1948 and discussed the feasibility of building a bowling club in Merrylands. Both considered it a brilliant idea, so a public meeting was called for Thursday, 8th April, 1948 to be held in the old council chambers. Aid. Bill Campbell, Mayor of Holroyd who occupied the chair, Aid. 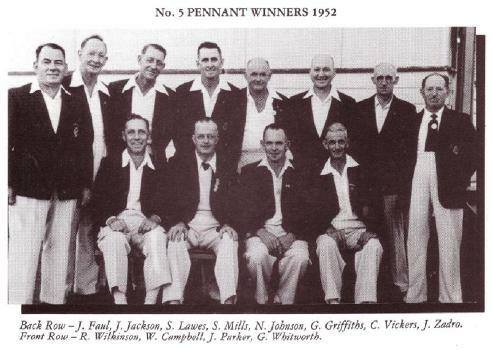 Cliff Creen, Mayor of Fairfield and the President of Fairfield Bowling Club, Aid E. C Styles, Jim Brown - Headmaster of Merrylands public school, Stan Crane, Ray Giblin - Smallgoods Proprietor, Bill Simpson, Andy Golquhoun, Ernie Maunder - Real Estate Agent, Doug McLaren - Solicitor, Ernie Ward, Allan Merton - Chemist, Sel Vincent - Salesman, Sid Mills - Foreman Coach Builder, Len Young - Hardware Merchant, Cliff Stimson, Phil Arnett - Town Clerk of Holroyd, Bill Bright - Proprietor of "Biz " newspaper and two ladies, Mrs E MCColough and Mrs F Bowden who attended to lend support to the proposal. 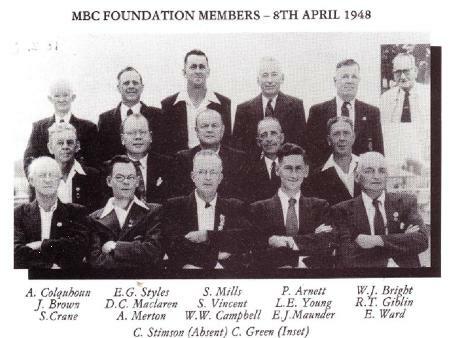 The meeting, though small, was in accord that a club should be formed and all those present who had agreed to Join, be the Committee of the Merrylands Bowling Club. Before the meeting closed, it was decided that a meeting take place the following Sunday for the purpose of looking for a suitable site for the Club. There was an option on Merrylands Park where the council had made provision for a two green bowling area. It was the committee opinion that such an area restricted the possible growth. Stan Crane suggested an area that was a disused clay pit, excavated to a depth of 7 feet (2.1 metres), full of stagnant water, reeds and rubbish which was owned by Messrs Newman and Underwood Tile Co Ltd.The Hon Solicitor and President called upon the Manager Arthur Talbot of bowling fame who agreed to put our request to the owners. They agreed and sold the parcel of land (hole and all) for the princely sum of £175 ($350). The lot on the corner of Cambridge and Newman Streets was purchased from a Mrs Rowley for £112 ($224). It is of interest to note that the Council rates for the first year were £2.13.2 ($5.32). A contract was let for putting down a green (No. 1), fencing and water services for £1,200 ($2,400). When it was time to grass the green, several members went to Warwick Farm Racecourse and collected 35 corn sacks of couch grass and put it through a chair cutter and it was then laid by the contractor Mr Dowse. Before the green was ready, a second contract was let for a second green for £1,000. The next problem was how to get Club rooms, as at this time there were strict building controls and all materials were directed to housing. However, in Bruce Street Merrylands, BW Simpson had closed his poultry farm and submitted the chook sheds to auction. These were obtained at low cost and, by voluntary labour, were transported and erected near the present site of the auditorium. All did not go smoothly however, as a visit from an Inspector of Building placed a stop building order and other plans had to be made. This problem has reoccurred in following extensions but, as then, they have been surmounted. Finally, it came to pass that on the 30th April, 1949 the official opening of the Club House and Number 1 Green took place in the presence of a large crowd of dignitaries, members, their wives, friends and visiting clubs who sat down to a sumptuous repast in a marquee which accommodated 300 people. When we consider that all this took place just one year and 22 days after the first public meeting, we must laud the efforts of those early pioneers — a staggering effort indeed. The occasion was noted in the local Biz Newspaper so: "Hundreds of people wending their way from all parts of Merrylands on Saturday last denoted that something out of the ordinary was to take place. Their rendezvous was the newly constructed green and rooms of Merrylands Bowling Club LTD which was to be officially opened that afternoon." The clubs that attended that day were Parramatta, Wentworthville, Auburn, The Hills, Lidcombe, Lidcombe Hospital, Bankstown, Liverpool, Campbelltown, Austinmer, Guildford and Fairfield. A month later the first Annual Meeting was held. The Treasurer was able to announce a nett profit of £390. Monies for the club has been raised in the first place by debentures - £3,000 in all from members. The book assets were listed as £3,850. It must be noted that the club did not qualify for a liquor license at that stage and possessed only three poker machines. Spirit refreshments were obtained by Sel Vincent through his business connections while beer was organised by Len (Nobby) Clark and his associations with the Commercial Hotel in Parramatta. Those of us who knew some of these early members have been fortunate to have met such worthy gentlemen. 1952 was the year that our first Pennant Flag was won, namely the No 5 Metropolitan Pennant - a fine achievement for such a young club. Before the meeting closed, it was decided that a meeting take place the following Sunday for the purpose of looking for a suitable site for the Club. There was an option on Merrylands Park where the council had made provision for a two green bowling area. It was the Committee opinion that such an area restricted the possible growth. Stan Crane suggested an area that was a disused clay pit, excavated to a depth of 7 feet (2.1 metres), full of stagnant water, reeds and rubbish which was owned by Messrs Newman and Underwood Tile Co Ltd.The Hon Solicitor and President called upon the Manager Arthur Talbot of bowling fame who agreed to put our request to the owners. They agreed and sold the parcel of land (hole and all) for the princely sum of £175 ($350). The lot on the corner of Cambridge and Newman Streets was purchased from a Mrs Rowley for £112 ($224). It is of interest to note that the Council rates for the first year were £2.13.2 ($5.32). A contract was let for putting down a green (No. 1), fencing and water services for £1,200 ($2,400). When it was time to grass the green, several members went to Warwick Farm Racecourse and collected 35 corn sacks of couch grass and put it through a chair cutter and it was then laid by the contractor Mr Dowse. Before the green was ready, a second contract was let for a second green for £1,000. The next problem was how to get Club rooms, as at this time there were strict building controls and all materials were directed to housing. However, in Bruce Street Merrylands, BW Simpson had closed his poultry farm and submitted the chook sheds to auction. These were obtained at low cost and, by voluntary labour, were transported and erected near the present site of the auditorium. All did not go smoothly however, as a visit from an Inspector of Building placed a stop building order and other plans had to be made. This problem has reoccurred in following extensions but, as then, they have been surmounted. Finally, it came to pass that on the 30th April, 1949 the official opening of the Club House and Number 1 Green took place in the presence of a large crowd of dignitaries, members, their wives, friends and visiting clubs who sat down to a sumptuous repast in a marquee which accommodated 300 people. When we consider that all this took place just one year and 22 days after the first public meeting, we must laud the efforts of those early pioneers — a staggering effort indeed. The occasion was noted in the local Biz Newspaper so: "Hundreds of people wending their way from all parts of Merrylands on Saturday last denoted that something out of the ordinary was to take place. Their rendezvous was the newly constructed green and rooms of Merrylands Bowling Club LTD which was to be officially opened that afternoon.